Columbia Plaza, one of the largest class A office buildings in downtown Cincinnati, has finished a portion of a multimillion-dollar upgrade of its common space. The office tower, located at 250 E. Fifth St., has been renovating its common areas since April 2017. A total of about $9 million has already been invested in the 29-story office tower with another $1 million expected to be spent this year. Its main tenants include Deloitte and Nielsen. Christian Hinkle, property manager for Columbia Plaza, said as employers work to attract the best talent, properties need to attract employers by providing amenities that are attractive to today’s workforce. “We want to be different than other buildings,” Hinkle told me as we toured the renovated space. To get a look at the renovations, click on the images above. The most obvious change is the expansion of the lobby. Previously about 4,600 square feet, the space more than doubled to about 10,000 square feet. 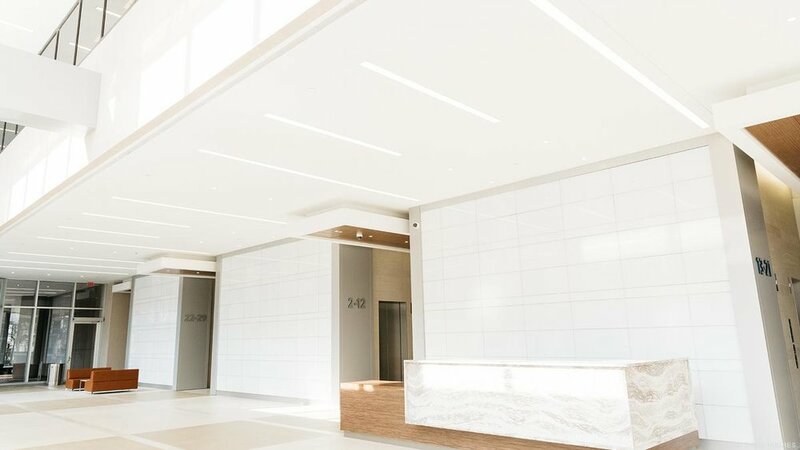 The lobby features high-end finishes including glass tile walls and wood paneling ceilings. Bill Poffenberger, executive vice president with JLL, is one of the leasing agents for Columbia Plaza. The changes take the property, which was built in 1984, and modernized it. “It’s so much brighter, so much more inviting,” Poffenberger told me. An outdoor area in the rear of the building also is being upgraded with new landscaping, soft seating and lighting. Hinkle expects this area to attract tenants when the weather is nice. The building is negotiating with a vendor to operate a coffee and lunch kiosk in the lobby. BHDP Architecture was the architect on the renovation project. Hunt Builders Corp. performed the construction work. The renovations also include new restrooms on every occupied floor of the building. Some of the floors without tenants also have had the bathrooms upgraded. In addition to the space tenants and visitors will see every day, the building’s garage also received a full upgrade. Hinkle said the upgrades doubled the lighting in the garage, making it safer and brighter. On the second level, some of the upgrades have already been completed. A new management office provides a conference room and meeting space for tenants. Hinkle said the room has already been used extensively. In the next 30 days, work is scheduled to start on additional second-level upgrades, including an art gallery, a living wall, new seating areas and the building’s community hub. This space will be where the community manager is located. A former U.S. Bank branch, the space will be transformed to include a kitchen area, a mini-market, a smart bar, seating with TVs, a room for table tennis and a room with a pool table and video game console. The bank’s former vault space will become shipping lockers. Hinkle also said the building is working with a caterer to provide take and bake meals so tenants can purchase dinners that are prepared and take them home. As renovation work continues on the Skywalk level, Columbia Plaza also is adding a community manager. This full-time employee will be tasked with activating the shared space in the building. Some examples could include bringing food trucks to the building or connecting employees with events happening downtown. “The community manager will foster a sense of belonging and create incomparable experiences for the tenants,” Hinkle said. Poffenberger said this type of position is common in larger markets but is new to the Cincinnati region. The upgrades are part of Columbia Plaza’s efforts to attract tenants. The building has more than 118,000 square feet of contiguous space available on the top six floors of the building, plus other spaces lower in the tower, including full floors on 14 and 20. Columbia Plaza is the 10th-largest office building in downtown Cincinnati, according to Business Courier research. The building has more than 537,000 square feet of gross leasable square feet.